Clever, right? I thought so. And although B doesn’t care for Kanye West (the artist playing), she has a sense of humor and helped me realize my idea. 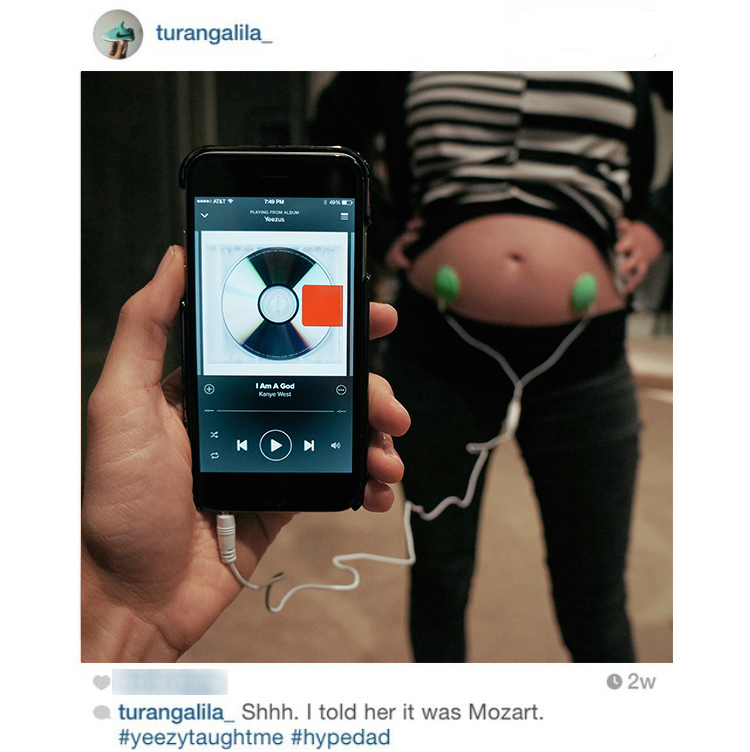 The #YeezyTaughtMe hashtag brought a small bit of traffic to the post. A few strangers commented, some even tagged a friend. It got over 150 likes. Not too shabby. I logged back into my personal account. 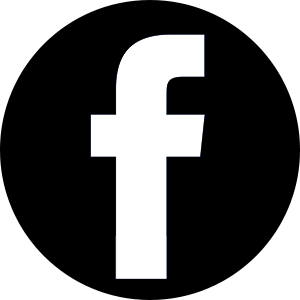 800+ new likes and hundreds of new comments and followers. My notifications page was so filled with activity that I couldn’t trace the source of the madness. I remembered receiving a message from @kanyedrawings, an Instagram account with 7k followers, asking if they could repost the photo. I checked their account and indeed they had. Ok, cool. That must explain it. Turns out, it was just the beginning. 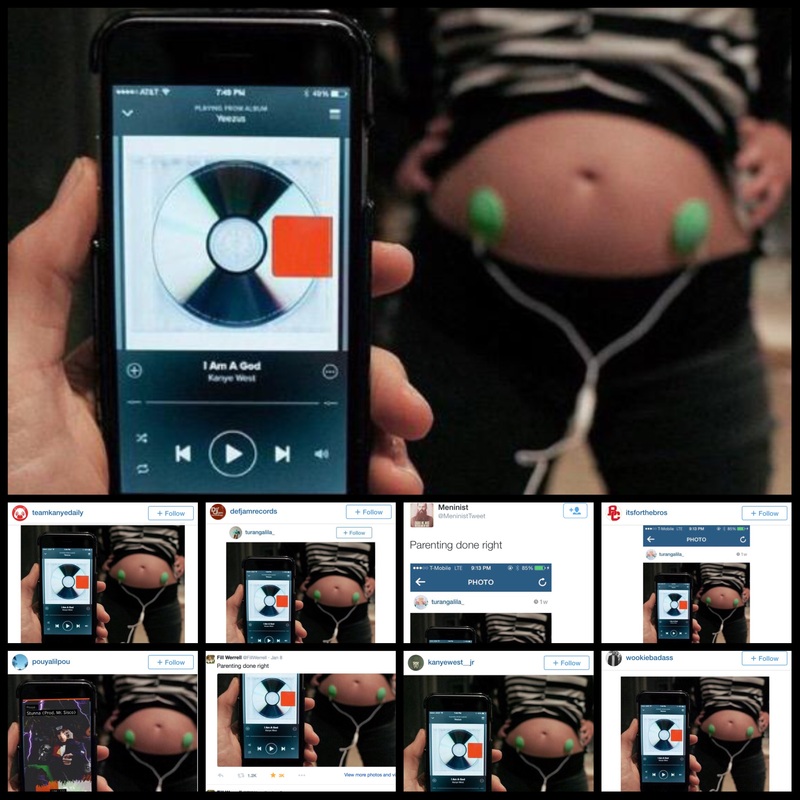 I casually scrolled through a few Kanye-related hashtags. Repost after repost after repost of our photo. Surely too many to come from @kanyedrawings alone. After all, 7k followers isn’t that many in the grand scheme of Instagram things. There had to be another source. Something bigger. I kept digging. Somehow I stumbled on @teamkanyedaily, an account with 63k followers and a dedicated website. They’d posted the photo, too. Only their repost had over 6,000 likes and 800+ comments. Another account @itsforthebros reposted it to their 143k followers. Now things started making sense. The next few days were a constant stream of new Instagram activity. People would tag their friends in the various reposts of my photo, and those friends would then tag their friends, creating an endless cycle of views, likes, and more reposts. Often those reposting didn’t tag me, so tracking the lineage of the photo was nearly impossible. The whirlwind of activity came to a head when DEF JAM RECORDS reposted the photo. Yes, the Def Jam Records. Crazy, right? A small taste of viral, the pinnacle of which was a repost by a historic record company. That’s what I thought, anyway. Until I checked Twitter. I kept seeing Instagram comments saying “I saw this on twitter” or “twitter brought me here.” Curious, I logged into my seldom-used twitter account. Nothing. I poked around a bit, searched a few Kanye terms. Finally, reposts of my photo came up. They were captioned “Parenting Done Right” and most seemed to be retweets from the same source: @MeninistTweet. I clicked their page. 573k followers. Wow, ok. I checked their repost of my photo. 16k likes and 8.3k retweets. At this point, I stopped looking. It’s called “viral” for a reason. It just spreads and spreads. Its myriad paths are untraceable. You could spend hours, days even, digging yourself deep down a rabbit-hole of hashtags and retweets. And for what? I’m about to have my first child. Ain’t nobody got time for that. It’s a curious thing, viral. Our innocent, joke-of-a-photo belongs to the internet now. B’s belly, our future child, is traversing the web’s chaotic network of disorder and we’re spectators like anyone else. It’s a strange feeling. You’re kinda excited, but completely detached. Imagine if we wanted it to stop. If it were an embarrassing photo or video like so many viral things often are. You couldn’t put an end to it. There’s rarely any one person to hold accountable. Scary, right? Yeah, so there’s that. For the record, though, the song was on pause. I never actually played “I Am a God” for our unborn child. In the end, going viral didn’t mean much for us. Exciting, sure. But I still have those dishes to do. The carpet still needs cleaning. A popular photo doesn’t change any of that. It’s a fun story, though. One we can tell our daughter someday. Maybe when she’s sixteen and thinks us to be the lamest people on earth. We’ll point to this photo to prove how fun and cool and hip we were. Tell her that, for a few days, the internet even thought so, too. Cool!! Oh and for the person who posted the rude comment, rap music won’t destroy your baby’s future. Years from now, when your daughter is old enough to start posting things on the Internet, you can use this story as an example of how one post can get out of hand. (Not that she’ll listen…). Enjoyed this story! What a fun experience! That certainly made me laugh! Very cool to show her in the future! Crazy how some things spread! But I completely understand your “reflection” too. It’s hard to know how popular we really want the little moments to be. I post preggo-belly stuff almost weekly these days, but I honestly don’t know what I’d do if one of them actually went viral. That is crazy, and a fun story to tell for sure! I’m guessing your account isn’t private…yet 🙂 My sister-in-law once told me about people using photos of children from blogs inappropriately, and it took me negative 5 seconds to limit all of my sharing! And what about people using your photos and pretending to be you? Creeeeeepy. Ah the things I never thought about before kids!! That’s gonna be a pretty dope story to tell your daughter! P.S. 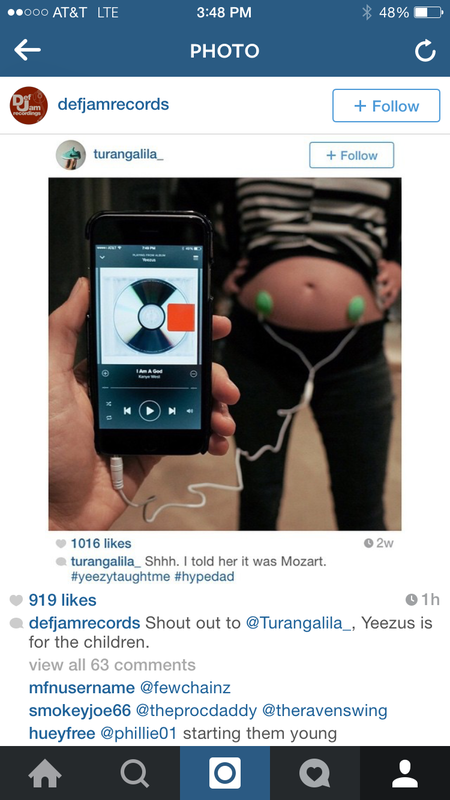 I played Stevie Wonder, Luther Vandross, Marvin Gaye, John Legend for my girl when she was in the belly and in return she would go crazy in my tummy whenever N*ggas in Paris came on the radio….Yeezy really is for the children haha! 🙂 Anyways great post! That’s very cool! It’s amazing what gets shared around the internet.